Starting Monday, 12 cities across the world will take part in Social Media Week. For those of you that don’t know what that is, I’ve been describing it as a sort of “unconference” – there is no central venue, and each city has a “producer” that helps coordinate events across the city. Any individual or organization can host an event – this will be VIA Rail’s second time hosting an event – as long as there is a social media theme. Toronto is the only Canadian city taking part in the week-long celebration of all things social, and I’ll be there learning, sharing and meeting awesome people. Here are my plans – let me know if you’re at any of these events! In partnership with the Fairmont Royal York, VIA Rail will be presenting four thought leaders who will share their thoughts on social media return on investment. But first, there will be a pre-conference train between Montreal and Toronto the morning of the event. Invited bloggers and social media influencers will discuss a variety of topics as they travel on board a private car to Toronto. Check out #SMWTOROI for great insights and conversations throughout the day and into the night! Be sure to come back later in the week for case studies, conference audio, photos and more! A Valentines Day breakfast tweet up introduces The Fairmont Royal York hotel’s new Executive Chef, while a panel of Toronto culinary influencers (Suresh Doss @spotlightcity, Jamie Drummond @goodfoodrev and Rebecca LeHeup @OntarioCulinary) engage Valentines fork play and what makes compelling #foodie content. At a time when business users have easier access to metrics and on-the-fly reports than ever before – where deep analytics and metric-based reports are a drag and drop away – we all struggle to bring insight, context, and predictability to the data we receive. What do the numbers mean? And what do we do with them? Join us as the Social Media Ref moderates in-depth discussions of different social media perspectives from key Canadian influencers – bloggers, journalists and PR pros. Two 18-minute competition-style panels will take on hot social media topics, with the Social Media Ref determining one collaborative solution for each panel. A panel of representatives from the travel industry, the media, PR, travel writing and travel blogging will examine a variety of questions — all within the “empowering change through collaboration” theme of the conference. Hosted by Toronto Travel Massive. For more information visit Toronto Travel Massive. I’ll be part of the panel for this one, speaking with Amy Blackmore of Fringe Montreal and others about what it takes to run a bilingual brand in the digital space. I’m not sure how I missed this inforgraphic on Community Manager Appreciation Day last month (mark your calendars! ), but I found it today and couldn’t help but nod my head in agreement as I read each role and responsibility. 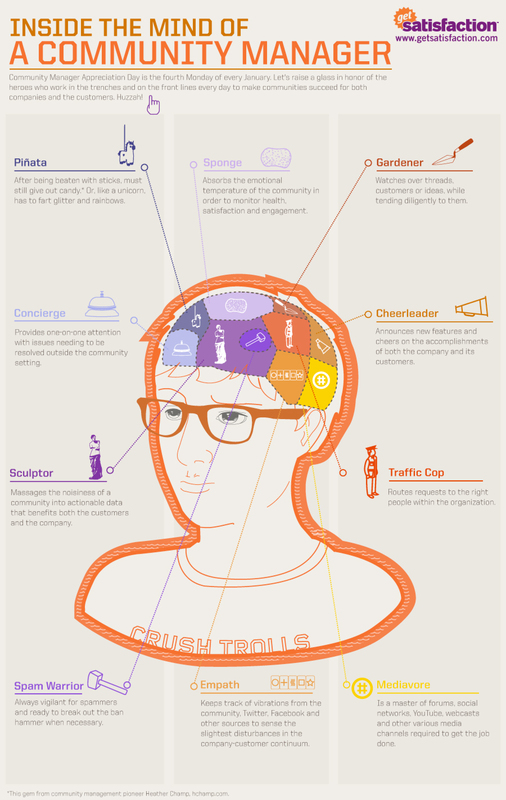 A community manager has a lot of parts to play internally and externally, and this graphic does a great job of summarizing some of the big ones. Developed by Heather Champ and found on the Social Studies blog – be sure to give them each a visit and take in their collective knowledge!